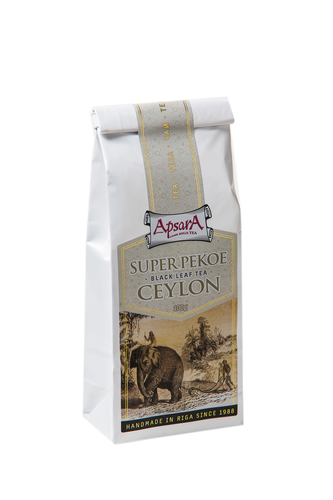 Ingredients: Ceylon black, low grown tea, Ruhuna region. Brewing instruction: Boil fresh water. Take a 5g tea for pot 300ml and allow tea to brew 3-5min. Features&recomendation with food: Excellent black tea with a rich as well as strong flavor and thick liqueur in the cup. Gives long-term invigorating effect to once mind and body. Recommended to serve as a leading drink for famous “5 o’clock” tea table, along with salty or sweet snacks, fruit and desserts. Product highligths: Among the wide variety of Ceylon black tea production you can find many very interesting and highly quality products. Super Pekoe refer to special way of leaf processing, as result tea undergoes intense rolling to get look alike “black pearl”. Tightly processing of tea leaf prevents sustainably of typical Ceylon black tea aroma and taste.